Hackers are taking aim at your small business website. Defend yourself—and your customers—with strong, affordable online security. Years ago, a small business could attract customers online with low prices alone. No longer. Consumers these days are well aware that cyberfraud is a serious danger, and they won’t do business with you online unless they’re sure your website is secure. That means you must do two things: One, secure your website. Two, assure visitors to your site that they’re protected while they’re there. Yet a lot of businesses do neither. 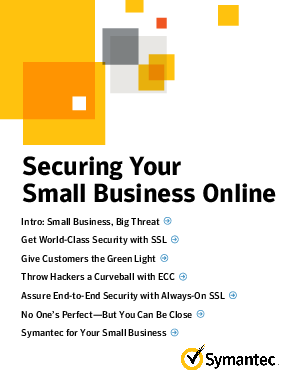 Many think hackers don’t bother with small businesses. Not true. The January 2014 Symantec Intelligence Report shows companies with fewer than 250 employees are the victim of 39 percent of all cyberattacks. Others think they can’t afford strong security. Again, not true. Small businesses today can get the same protection used by large companies—and get it at an affordable price. These security solutions are easy to implement and easy to manage, with no need for onsite IT staff.